CHICAGO, IL--(Marketwired - June 13, 2013) - Cision launched a new content marketing suite to help brands create, amplify, and analyze their branded content. Through the new suite, customers create stories through their brand's social newsrooms, amplify those stories on top publisher sites like Time, USA Today, TMZ, The Food Network and Bloomberg BusinessWeek, and analyze the results of their campaigns. "Branded content is fast becoming a necessity in any integrated communications, marketing or PR program," said Peter Granat, CEO of Cision. "Our content marketing suite not only offers our customers the ability to create that content, but to acquire new traffic from engaged readers at top publisher websites." "PR professionals have helped their brands and organizations power their stories through a lot of traditional PR tactics," Granat adds. "Content marketing is the next step in the evolution of how we share that content with our target audience." "Content Marketing has easily become the most actively researched area for our business," said Cision customer Daniel Durazo, Director of Communications at Allianz Global Assistance. "Before we became aware of Cision's Content Marketing Suite, we had this vague idea that we needed to do something on content marketing, and kept hearing about content marketing, but didn't know what to do to take that first step." After amplifying content with Cision, Allianz found that their expectations of the results were "far beyond what we expected in the number of impressions and clicks we are now getting," said Durazo. "Within the first 13 days of amplifying our content, we exceeded the number of clicks we had planned on getting for the full month. We had an extremely high percentage of increased views and increased our traffic by 20%." Create: Create and publish content (blog posts, white papers, tip sheets, infographics, top lists and more) and easily share via social channels like Twitter, Facebook and LinkedIn. Amplify: Drive traffic to stories on your Cision social newsroom, or earned or owned media from external sites, by amplifying that content on a premium publisher network, including sites like Reuters, the BBC and Rolling Stone, reaching over 200 million unique visitors a month, to reach new, highly engaged audiences. Links to your amplified content appear as recommendations on the web's largest content publishers based on an algorithm that predicts and surfaces what content viewers are the most interested in reading and watching. Analyze: Receive metrics that tell you how people accessed your content, how many impressions and click-throughs your content received on the publisher network, and which content is driving the highest user engagement through social sharing. 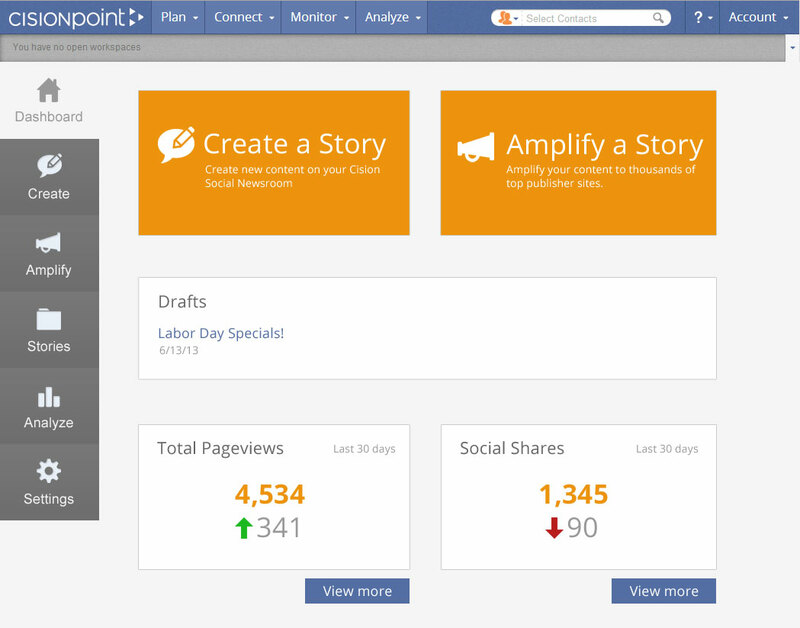 Cision's content marketing suite will be available by subscription through Cision's Marketing and PR software platform. To learn more visit http://us.cision.com/content-marketing.